Those idyllic (extremely happy) farm scenes depicted on most conventional dairy products, meat packaging, and egg cartons are far from the reality of how conventional meat comes to be. Unlike organic livestock conditions, factory farming puts animals in gruesome concentration camp-like conditions to prepare them for horrible deaths. If you don’t think this is true, just simply watch documentaries like Food Inc., Death on a Factory Farm, Fresh, or simply search Google to view videos of animal cruelty on factory farms. If you don’t think animals are sentient beings that deserve proper treatment, as they produce your eggs and dairy products or groomed to become your servings of meat, then you should be at least interested in how the treatment of factory farm animals affects your health. 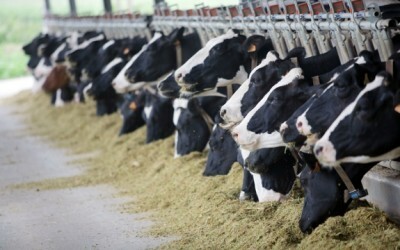 Cows and cattle raised conventionally are often stuffed into feed lots known as confined animal feed operations, or CAFOs, and are given a diet primarily of genetically modified corn and grains. These animals are grass grazing animals that don’t belong in these conditions; they have masticating teeth for chewing grass or alfalfa and long complex digestive tracts to absorb plant nutrients. And they are accustomed to wandering about in open fields, or at least they used to be. CAFOs are incredibly crowded with animals that are forced to stand in manure and urine while feeding or being milked. This confinement, along with the type of unnatural feed they’re forced to eat, makes them disease breeders. It is for this reasons that most antibiotics, 70-80%, are used for factory farm animals for both disease prevention and to stimulate unnatural growth. Growth stimulants are prohibited in Europe, but not here. And those antibiotics can arrive in your meat and dairy, depleting your healthy bacteria and creating more antibiotic resistant pathogens, or super bugs. Mainstream medicine has been concerned about the constantly growing threat of super bugs for decades, and are now even greatly concerned over the use of antibiotics in livestock for that reason. Banned in 27 countries, recombinant Bovine Growth Hormone (rBGH) is injected into cows to force more milk production. Biotechnology corporation Monsanto created it by combining cow DNA and E. coli (really). Now Eli Lily owns it. It infects cows’ udders, demanding a plethora of antibiotic injections and causing gross malformations It also leaves small amounts of pus in consumers’ milk. For some time, farmers who labeled their milk “no rBGH” were threatened financially with “legal actions” by Monsanto. Farmer and media backlash has halted this violation of first amendment rights, and now dairy farmers are not being harassed for promoting their products as hormone free (or at least in the same way). But rBGH treated milk, which has fallen out of favor with most health-conscious consumers, still comprises an estimated third of the milk in stores, and it is not labeled. Factory farm fowl is treated foully too, and their overcrowded conditions have led to large lots of eggs being recalled with massive breakouts of salmonella. CAFO feed is usually a combination of corn and soy meal. Almost all corn and soy in the USA is genetically engineered or GMO. In addition to this GMO factor, which gets passed on to consumers, GMO farmers have to use excessive amounts of glyphosate pesticides, which is hazardous. So those soy and corn products used for bovine feed brews pass on this mysterious pathogen in addition to traces of these extremely toxic glyphosate pesticides. Purdue Plant Pathology Professor Emeritus Don Huber, a pathologist with years of Army research and university experience, was the recipient of many alarming reports from livestock farmers in the Midwest. More of their animals were sickly, dying younger, and unable to reproduce or producing stillborn calves. Don Huber investigated and discovered that the new pathogen was the probable source of their issues. So Huber sent a letter to the head of the USDA, Agriculture Secretary Tom Vilsack, explaining the situation and requesting a moratorium on Roundup pending further research. In Europe this is considered acceptable as a precautionary principle, which calls for a moratorium of activity with suspected risks to health or environment until safety can be assured. His letter was ignored. But soon after, several Midwest universities with agricultural leanings, including Purdue, denounced Don’s findings. All this should have been expected. As governor of Iowa prior to heading the USDA, Vilsack was named Governor of the Year in 2001 by the Biotechnology Industry Organization. Vilsack’s non-response to Huber, accompanied by a flurry of academic Huber bashing shortly after, show how little our federal food and health agencies care about our health and the future of farming in the USA. But we can stay away from all this by simply going organic. If you can purchase raw dairy products, go for it. Make sure your eggs are labeled free range and not just cage free. Cage free can be a con. Eating organic grass fed meat that’s not injected with antibiotics or hormones is a little pricey, but is worth it if it’s in your budget. Try to buy from local area farms at farmers’ markets. Better yet, go vegetarian or vegan if that works for you. Farmed factory animals are fed GMO poison.